There are many ways to help your eyes function at their very best, and that includes good nutrition. Both for the overall health of your eyes, and for specific diseases like macular degeneration there are many vitamins and minerals that are helpful. For those with macular degeneration, the Age Related Eye Disease Studies recommended a supplement to your diet of minerals and antioxidants, including lutein, zeaxanthin, vitamin C, vitamin E, zinc and copper. This formulation is available over the counter. To maintain overall eye health, we recommend a diet high in minerals and antioxidants. The best sources to get these are from green leafy vegetables, such as kale, spinach, collards and turnip greens, as well as fruits, berries, and other colorful vegetables. Supplements with zinc, selenium, lutein and vitamins A, C, and E are also good. A diet high in omega-3 fatty acids and low in omega -6 fatty acids is also beneficial, especially for those suffering from dry eyes. 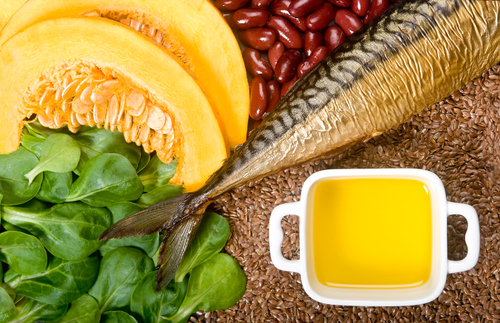 Omega-6’s are pro-inflammatory, which can contribute to the inflammatory component of dry eye. They are generally found in meats, oils, margarines, and carbohydrates, which make up a large portion of most Western diets. Omega-3’s have anti-inflammatory properties, and can help your tear glands produce high quality tears. These can be taken as a supplement, or from a diet high in nuts and cold water fish, such as salmon. While flax seed oil supplements are good, a high quality fish oil with a large concentration of EPA and DHA is the best option, as this is easiest for your body to utilize.